Some of the best Christmas entertainment of the twentieth century has gone largely undiscovered for generations. The 1930s and 40s, the so-called golden age of radio, gave us not only some of our best loved Christmas music, but also a trove of Christmas audio dramas. Of course, the music has remained popular through the decades, but the radio shows were swept into obscurity when TV took over. But those radio shows hold up surprisingly well, and present a whole world of Christmas magic waiting to be discovered. In 1937, young listeners were introduced to Judy and Jimmy, two children who go to up their attic to find their favorite Christmas ornament, only to be swept into an adventure through the magical Maybeland with the help of a talking Teddy Bear. The Cinnamon Bear was a serial story broadcast six days a week between Thanksgiving and Christmas. When the thieving Crazyquilt Dragon runs off to Maybeland with Judy and Jimmy’s precious silver star ornament, Paddy O’Cinnamon leads them on a quest to find it. Along the way, they encounter a cast of talking animals and mythical creatures, and sticky situations. Each of the 15-minute installments ends in a cliffhanger. Eventually, the team finds its way to the North Pole, where Santa Claus himself gets in on the action. In episode 6 of Christmas Past, I talked about how Rudolph the Red-Nosed Reindeer was introduced in 1939 in a promotional storybook given out the Montgomery Ward department store. The Cinnamon Bear started out much the same way. The Portland, Oregon-based Lipman’s department store commissioned the story, which was then broadcast on local stations. Lipman’s ran local newspaper advertisements saying that children could meet the characters from The Cinnamon Bear in the store. 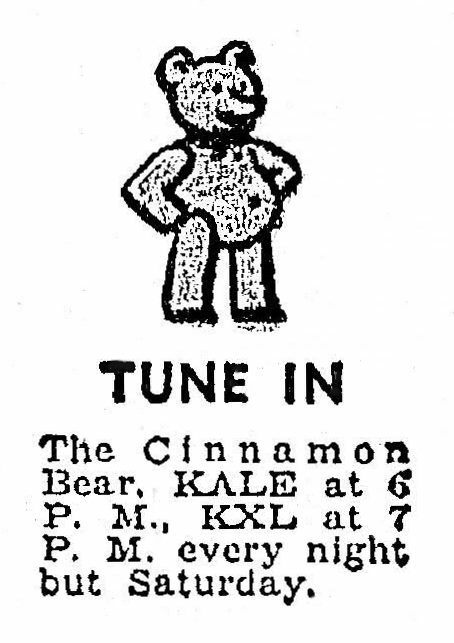 Cinnamon Bear is a rare exception to old time radio shows, in that it is still broadcast on some radio stations today. Portland, especially carries a strong tradition–there are even Cinnamon Bear cruises in Portland. The story has also been adapted for the stage, and a 1951 TV show featuring puppets of the characters. But for pure storytelling magic, and unabashed Christmas nostalgia, nothing competes with the original 26-episode serial!